BRUSS are specialists in the design and manufacture and support of mobile weighing scales including fork lift truck scales and hand pallet truck scales. The BRUSS range of scales can be installed on most types of material handling equipment. The BRUSS scales are designed for long time use only! MHW Plus hydraulic scale are ideal for the majority of applications with a typical level of accuracy of 0.2% of the capacity of a fork lift truck. Hyperforks scales are used for applications where high accuracy is required. 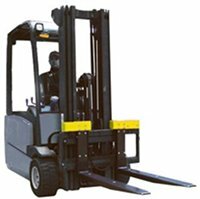 The typical accuracy is 0.1% or better of the capacity of a lift truck. BRUSS Mobile Weighing produces a full range of high quality mobile weighing scales. BRUSS Mobile scales design a range of scales for pedestrian and stacker trucks. Warehouse Scales A range of platform scales and semi-mobile beam scales are available for general weighing requirements. A choice of options is available with all BRUSS products and our experts will have a solution to your material handling weighing requirement.